As one of the last things in the DC area to flower in the fall, witch hazel has a special place in my heart. It's not that the flowers are particularly showy -- the petals are just small yellow wisps, really. But the flowers of Hamamelis virginiana start blooming in October, and can keep going until Thanksgiving or even later. Witch hazel (or witchhazel) is an understory shrub that grows up to 20 feet tall. Its flowers are about a half-inch to an inch wide, and they come in clusters of 3-5, on a little stalk coming off the twigs of the shrub. They'll form clusters of seedpods which explode when they're ripe, shooting their seeds up to 30 feet away. You may see some seedpods on the tree at the same time as the flowers are blooming. There's another native species of witch hazel that, rather being the last to bloom this year, will be one of the first blooms of next year. Hamemelis vernalis often has redder flowers, and they're slightly smaller. We've never seen it in the wild, so let us know if you see some this winter! There are also Asian species of Hamemelis that are often planted ornamentally that flower in the winter. 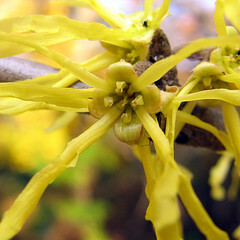 Many people have heard of witch hazel because the bark and leaves have a long history of medicinal use as an astringent. But the "witch hazel" you can now buy in a store actually has very little witch hazel in it. It's made by soaking the leaves or bark in water, distilling it, then adding alcohol. People disagree on whether witch hazel actually has any effectiveness after the distillation process -- it may be the alcohol that's doing most of the good when you use this product. We've never tried making our own -- this tree just isn't common enough to justify it. 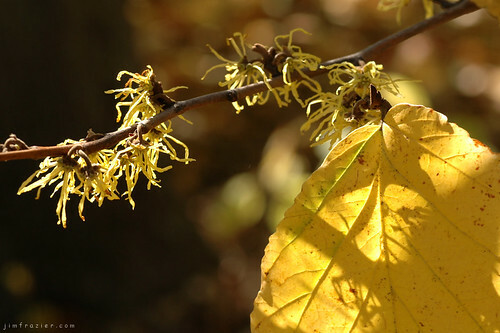 In the wild: Witch hazel likes moist soil, though we've also seen it on dry mountainsides. They're scattered along the Valley Trail in Rock Creek Park -- on our last hike we noticed several directly across Rock Creek from Picnic Area 8 that were in bloom. There used to be a nice stand of small witch hazels on the Rachel Carson trail north of Colesville Road, but a couple of years ago they were taken out by beavers. We'll have to check on whether they've managed to come back. In your yard: Garden books recommend them, but the witch hazel we planted a few years ago still seems to struggle in the summer. All trees want a lot of water in their first year after planting, but this one perhaps more so. 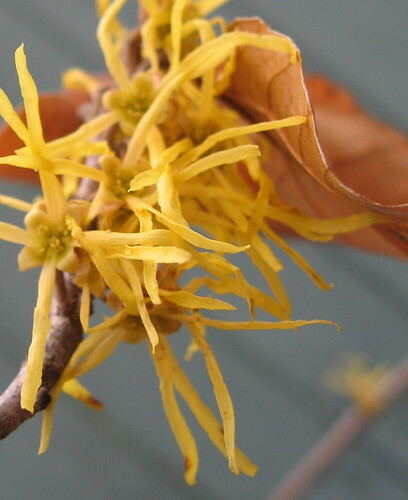 Where have you seen witch hazel in the DC area? Leave us a comment below.